The whole point of this hike was to stroll down the 6-mile Corridor Trail connecting the upper and lower sections of Pilot Mountain State Park and check out the Yadkin River at the far southern end. I knew I was in for 12 miles, but I never counted on hiking 15 and never getting a glimpse of the river. The Corridor Trail near its southern end; it’s 5.5 miles from here but the whole thing is over 6. Which is fitting, because my new hangout is less than a quarter mile from another bend in the slow-rolling Yadkin. I think the fates were punishing me for driving 30 miles and walking another 15 when I knew good and well what the river looks like. Wide, muddy, meandering, best seen from an innertube with a beer in one hand and a fishing pole in the other. 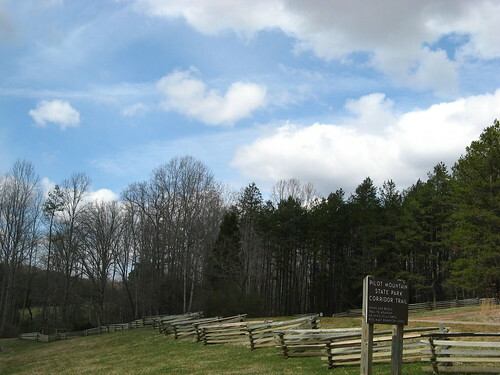 So about the trail: It starts out from the west end of the Sauratown Trail, which connects to Hanging Rock State Park 22 miles to the east. OK, so it’s 28 miles of dodging horse poop but it could be worse — at least it ain’t cows. The Corridor is a 100-yard-wide tree tunnel cutting through a countryside dominated by farms, timber and a few ranches. The trail has a decent gravel bed in most places and requires a bit of rock hopping over a few creeks (I suspect these run dry later in the year). The Yadkin River bisects the southern section of Pilot Mountain State Park, so hiking the Corridor Trail implies a visit to the river. I had it in my head that the trail ended at the water’s edge, but no dice: it’s at least a mile and a half one way to the riverbank, which means 15 miles to kick back and play Huck Finn (rafts built from driftwood would probably land you in a lock-up these days). Actually the hiking’s much better if you do the obvious thing and drive to the southern section: 5 to 7 easy to moderate miles, and you can wade over to an island in the river after the spring floods dry up. 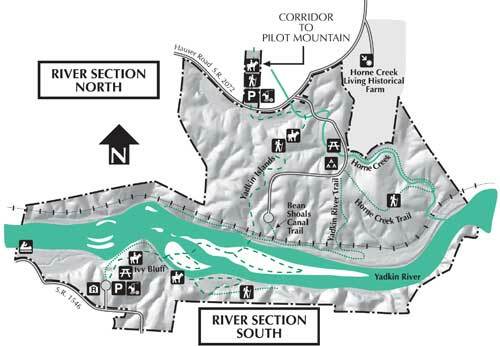 This map gives a rough idea: quite a few trails go down to the river, and one goes all the way across. Parking lots on both sides allow drive-up access (though finding your way there through a tangle of two-lane blacktops will be some fun). Disclaimer: I have no idea how dangerous these crossings are. 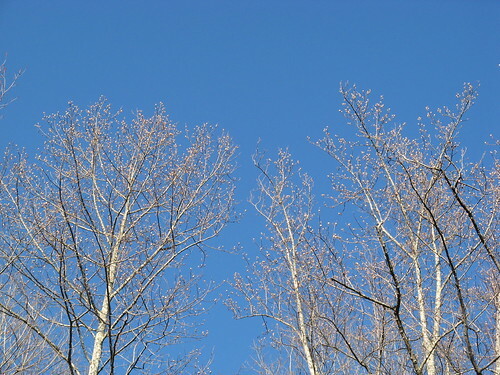 Look real close and you can see the buds forming on top of these trees. We had the nicest weather since November this past weekend. It was a break in three days of rain, so the trails were pretty mushy. I’ve hiked in much worse, though: the state parks folks here keep these trails pretty clean. How can you tell if you’ve missed your turn? 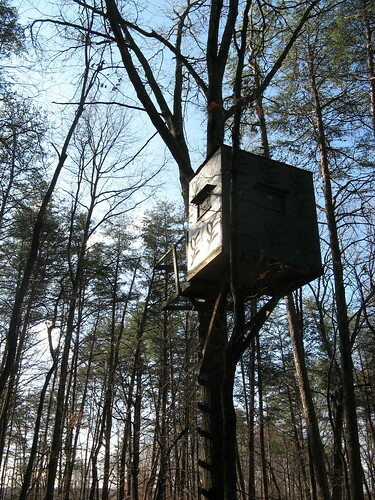 First, trail maintenance disappears; second, strange tree-houses start appearing. (This is about a mile from the northern trailhead. If you see this, turn back and retrace your steps till you see white blazes and try your luck again). 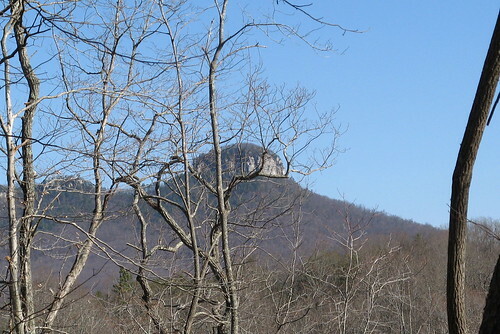 The views of Pilot Mountain won’t last long now that the trees are starting to bud. What’s that saying? When you get to the fork in the tree, take it. 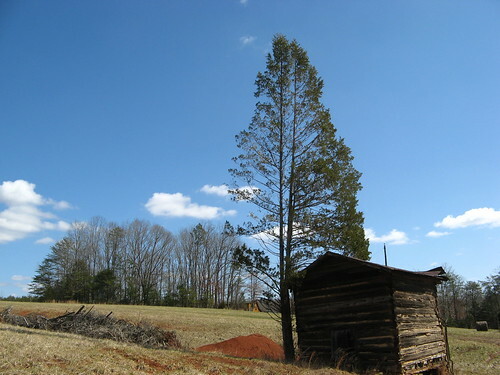 Here’s a nice country scene near the southern end of the Corridor Trail. On my way to see the Yadkin River I turned on the Horne Creek Trail, reasoning that it must empty into it. 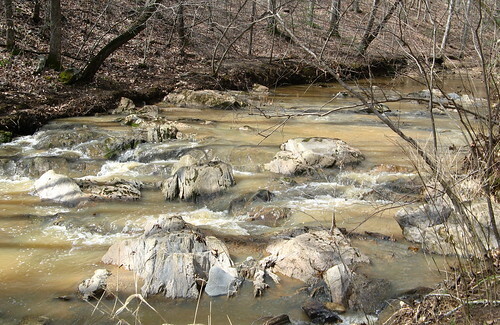 The creek does, but the trail doesn’t: it’s a loop of just over a mile. Fortunately it’s one of the nicest parts of the hike. At the end of this trail I was still a good half-mile from the river’s edge and my GPS was telling me I’d already walked well over eight miles. That was when I remembered I’d seen this river before. Maybe not here, but with seven miles of walking ahead of me it was close enough. See, the park is quite scenic at this end, but six hours of getting there and getting back dims the gloss a bit. I felt like I had to hide this section of Pilot Mountain State Park because I hadn’t before. The walk down to the southern section is pleasant enough — a couple shoe-soaking creek crossings, plenty of up-and-down to keep the body busy, none of it painfully strenuous. But once you get to the southern end, where the trails are more suited to hikers than horses, you want to explore more. You’re talking 18 miles to do it up right; fine if you’re up for it, painful if you aren’t (I can’t remember the last time I hiked 15 miles in a day; must’ve been a couple years ago. My feet were not pleased). Looking ahead, the weather’s getting much saner up in the mountains, so I should be heading up that way in weeks to come. Won’t be long till the thru-hikers start heading north along the Appalachian Trail; also, Trail Days in Damascus, Va., is less than a three-hour drive from here so I may give it a look too. Pilot Mountain map (PDF download). NC state parks on Google Earth. I found your website to be intersptial, North Caolina is a very UNIQUE STATE, intrastate intourist guide planning. 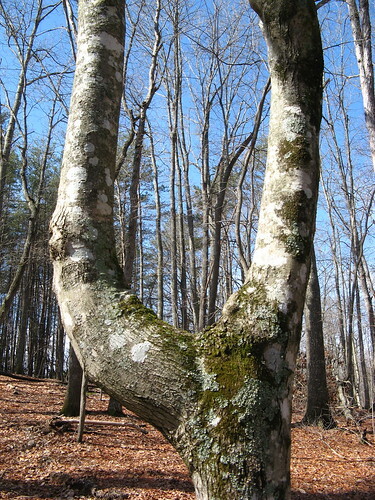 I didn’t know about the woodland guides untell I came across this webpage; “Bravo! Well Done!” I will post this webpage on my Facebook Site. I work as a Microscope Artist; living in NC. I HOPE YOU WILL ENJOY SOME OF THE PICTURES OF THE ART; I enjoy creating.